Somewhere between the beautiful Tuscan cities of Florence and Arezzo, following a difficult ascent up a steep trail which meanders around the Pratomagno bend, is the unique town of Gropina. Although it involves a backbreaking climb up an almost impossibly steep hill, it is journey which is definately worth it as after passing the picturesque Etruscan village of Loro Ciuffenna, with its quaint houses which cling desperately to edges of a vast stone gorge eroded into the land by violent currents of water, you finally reach Gropina. A truly unique sight, Gropina is made up of a handful of isolated stone buildings arranged in a circle, at the centre of which is large Romanesque parish. From this parish, engulfed by the delicate green of the many surrounding olive trees, you can enjoy breathtaking views of the Arno Valley with its numerous fast-paced towns and cities and also, immediately behind, you can just about make out the dark outline of the Chianti region. It is an area of spectacular natural beauty, proof of which exists in the form of Indian fig bushes which grow profusely and flourish in the rich land just behind the dry-stone walls. In the past, Gropina was just small place along the road called Of the Seven Bridges. In Medieval Times, this road was greatly used by pilgrims travelling to Rome as the route allowed them to avoid the unsafe marshland at the bottom of the valley. Therefore, although you would have never guessed from its remote posion today, it was quite an important place. Built in an area that was once an important place of worship, well before the arrival of Christ’s message of salvation, a date which is significant in many other cases. In fact, the current building dates back to 12th century and became erected upon the ruins of another primitive church sometime between the 12th and 13th centuries. Even more mysterious is the presence of a Roman or Etruscan building, which is also quite possibly dedicated to the worship of some unknown god. These buildings are unlike most other Romanesque buildings, which usually feature straight edges and steady surfaces, because their structure seems to almost want to confuse visitors. Only by examining the exterior of the buildings closely you will notice that there is something that is not quite right. Firstly, there is the grey sandstone facade which appears red in the glow of the setting sun and is a great example of one of the many transformations of this building. But, why is the only door, which is extremely simple, placed slightly left of centre, and why are the blind rose window and the mullioned window not lined up? 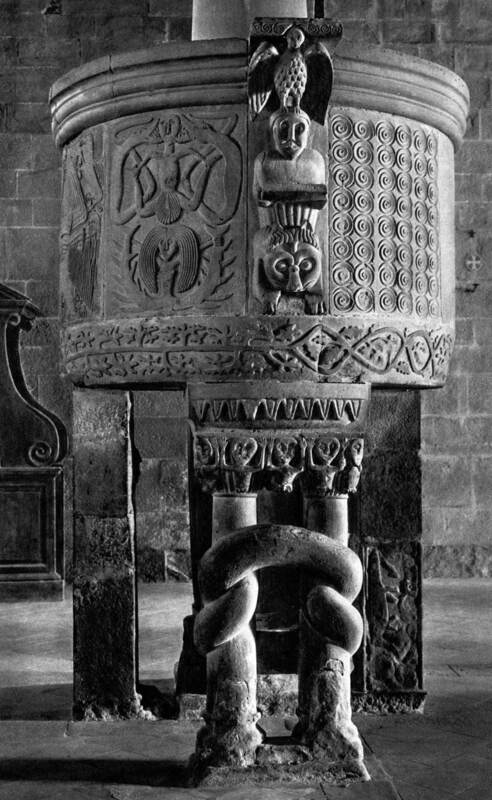 And did the builders want to knot the two central columns of the church’s apse in such a bizarre way? This asymmetry becomes almost unbearable as we go inside. Once your eyes adjust to the dim lighting, it seems as if you are lost in a dreamworld made of stone, a medieval hallucination that has been created here in the highlands of Pratomagno. Inside the church you’ll see a line of lions with bowed heads, eagles and wolves devouring defenceless lambs with their sharp teeth, and a sow nursing her piglets. Knights armed with lances and sheilds slay demonic monsters, a chimera peaks out between leaves, and dragons interwine with female forms, Samson is astride a lion, a garlanded Christ blesses the figures, and the Apostle Peter proudly displays his keys. It seems also that the supernatural lives here. This is confirmed as you descending the stairs to the crypt, where among the excavations and crosses scratched into the rocks (dating from the Lungobard period) a face from the Barbaric era fixes us with a smile that is somewhere between playful and enigmatic, not revealing however, any of its secrets. I would like to visit Gropina in November. Will we be able to get inside? Do we need to get a key from someone? the village is functioning, the church will open, but the time table will be different , if you want I get get the information for you. rispondiamo con un pò di ritardo, ma saremmo ben lieti di ricevere informazioni a questo riguardo più dettagliate ed aggiornate! I’ve been exploring for a little for any high-quality articles or weblog posts in this sort of space . Exploring in Yahoo I ultimately stumbled upon this site. Reading this information So i am happy to show that I’ve an incredibly good uncanny feeling I came upon just what I needed. I so much no doubt will make sure to do not omit this web site and give it a glance on a continuing basis.